In the spring of 2016 a new temple site was detected about 450 m west of the obelisk of Senusret I inside the temenos of the temple of Heliopolis. Fourteen sondages measuring about 4 x 4 m were excavated in the spring of 2016, 64 more in the autumn season. The ground water table in this area was too high to excavate larger sections and/or to record more detailed features. Within the first sondages in the most nothern part of this area fragments of large statuary made of silicified sandstone were discovered. Among them a white crown of Upper Egypt, which belongs to a statue twice to three times life-size. 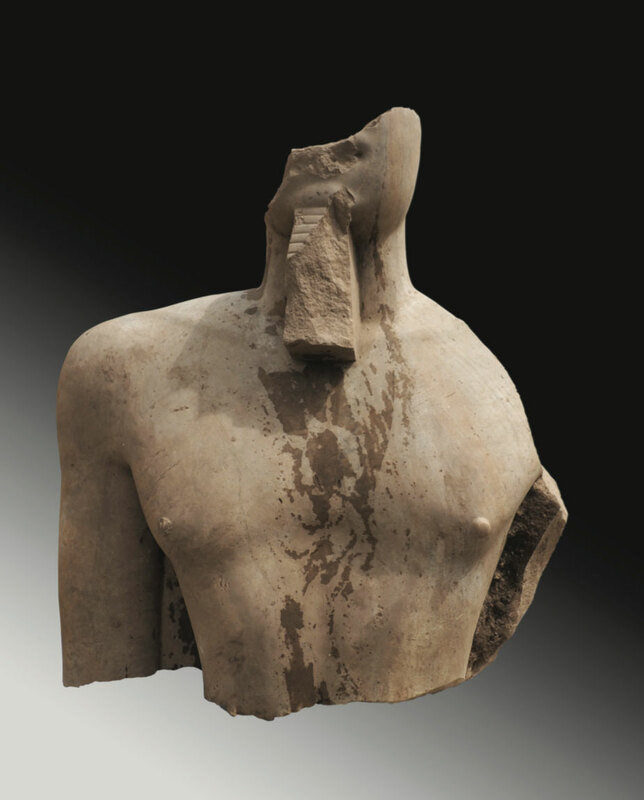 Even the upper part of a reworked statue of a god was found there. This fragment probably showed the god Hapi or Nehebkau before the beard was carefully removed. Especially the large sculpture points to a court or facade of a temple. Further south architectural elements like large bases for columns made of limestone were uncovered. In the autumn of 2016 even large blocks with reliefs showing the king offering in front of the gods and anointing them were found scattered in the centre and the south of this area and possibly point to a sanctuary of this temple. A special aspect of these blocks is the name of the king as written in the rare variant “Paramessu”. In the most southern part of the area a seated, headless statue made of silicified sandstone was discovered. The inscription reveals that it was commissioned by Ramses VI. Furthermore, fragments of a small obelisk of Ramses VI were unearthed nearby. This temple might point to the later decades of the long reign of Ramses II and could indicate that three festival temples (Suq el-Khamis Area 200-201, Area 248, Area 221) were erected by him in the western part of the cult-centre of the sun-god. They seemed to be aligned along the axis that led from the ity-Canal in the west via an avenue of sphinxes to the obelisk. Temple site 248 fills the gap between the temple of Ramses II in area 200 and the temple of Nectanebos I in area 221. On the other hand, at least in this area there seems to have been a hiatus in building activity between the Ramesside Period and the 30th Dynasty since no evidence for any relief decoration of the Third Intermediate Period or the Saite Period has come to light.